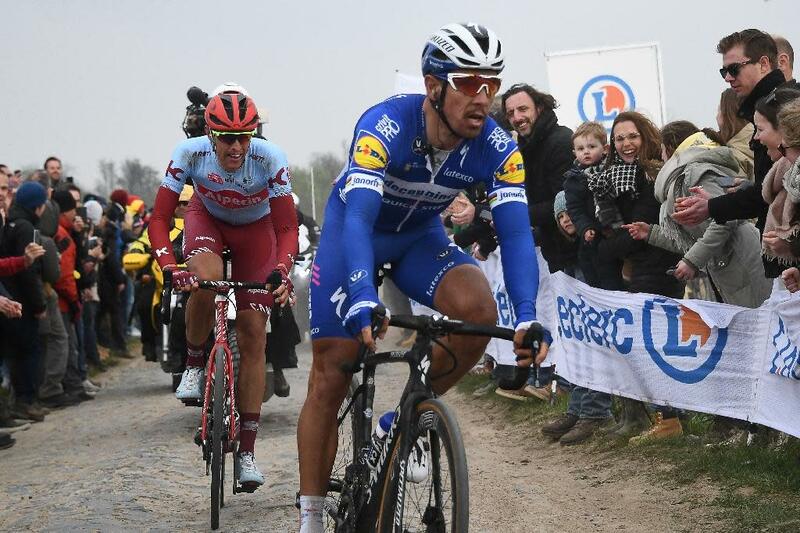 Roubaix (France) (AFP) – Belgian veteran Philippe Gilbert won the cobbled classic Paris Roubaix cycling race on Sunday after a cat-and-mouse final struggle with Germany’s Nils Politt while another Belgian Yves Lampaert was third. The victory gives former world champion Gilbert his fourth of five of the so called ‘Monuments’, long one-day races. He has won the Tour of Flanders, the Tour of Lombardy and Liege-Bastogne-Liege, just the Milan-San Remo is missing from his prize list. Gilbert called his bid for all five Monuments ‘Strive for Five’, after winning Flanders solo in front of adoring home crowds in 2017. Politt and Gilbert came into the iconic Roubaix velodrome 30 seconds clear of Belgian champion Lampaert. The crowd cheered wildly as they eyed each other on the final lap. Gilbert pulled ahead with 50 metres to go before crossing the line in emotional scenes of joy. “Its really special. It was a really daring attack and it came off,” said the 36-year-old who also led an earlier breakaway and was the architect of Sagan’s downfall. “When I decided to go for the classics they said the cobbles weren’t for me. I was just a puncher, but now I’m more complete. The race is known as ‘the Hell of the North’ due to its 29 body battering cobbled sections, some 54km of the 257km race, which are even given star ratings of one-to-five for their difficulty and danger. British outfit Team Sky, who are changing sponsors, had been hoping for a farewell win and set a fierce early pace but when Italy’s Gianni Moscon fell and then team leader for the day Luke Rowe got a puncture, any chance of an unlikely send off celebration were undone.